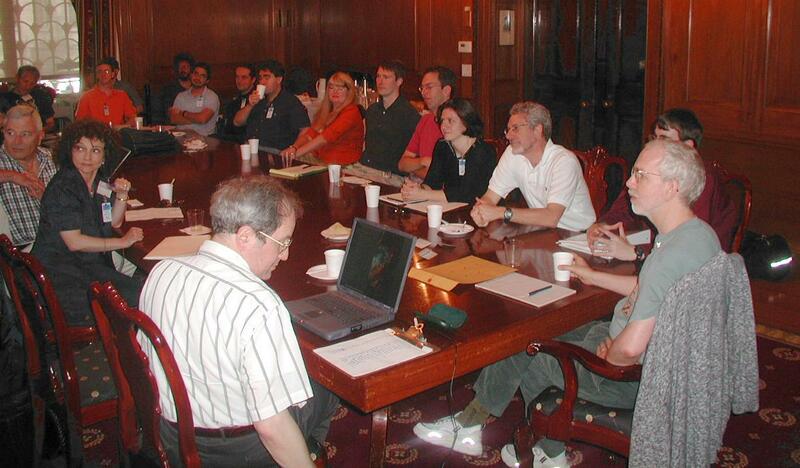 In June, 2002, Piet Hut and Mike Shara organized a one-week workshop in New York, at the American Museum of Natural History, bringing together experts from stellar dynamics, stellar evolution, stellar hydrodynamics, as well as other interested astrophysicists and computer scientists. At the end of the meeting, the acronym MODEST was coined, and the meeting was renamed MODEST-1. It was decided to continue with a series of biannual meetings, with MODEST-2 in Amsterdam, in December of 2002, and MODEST-3 in Melbourne to coincide with the General Assembly of the International Astronomical Union. A snapshot of the opening discussion at MODEST-1, June 17, 2002, at the American Museum of Natural History in New York City. MODEST-1 took place June 17-21, 2002, at the American Museum for Natural History, in New York City. The MODEST-1 summary paper, contains the main conclusions of the workshop.